Del-Tron’s VB, VR and VS High Precision Positioning Stages take positional accuracy, performance and actuator flexibility to a new level. 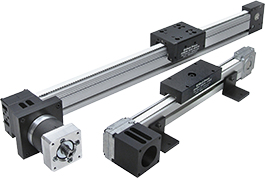 Utilizing Del-Tron’s proven ball and crossed roller technology and more than three decades of experience manufacturing linear slides and stages, we offer three new model numbers to enable you to choose the method of actuation best suited for your application. Build your own High Precision Stage by simply picking out the ball or crossed roller stage that meets your application's needs, choosing one of the 4 methods of actuation: Micrometer head, Fine thread adjustment, Lead screw or Motorized actuator. Positioning accuracies range from 0.0001” per inch of travel straight line accuracy on our VS series to 0.00004” per inch of travel straight line accuracy on our VB and VR series ball and crossed roller stages. For your convenience solid model drawings for our entire product line are available by clicking on our Part Search. Click on the product you're interested in to find the solid model on the product data page. We are always ready to discuss any special needs or modifications you may require. Additional industry terms include positioning stages, manual stages, manual linear positioners, manual linear stages, linear positioners, XY stages, micrometer slides, roller tables, and more generally as linear slides, linear actuators, linear translation stages, or motion slides.